Innovative online tools to transform and grow your SMB. Since June 2000 we’ve been building software applications to help businesses and organizations of all sizes innovate and automate. We’ve got some serious skills around seeing patterns, processes, and systems and figuring out how to build cloud-based software solutions to make things run even better. You want to grow your business, increase revenues, and keep more money – while working a little less hard. Ultimately this means you need to work on your business, automate, and put innovative solutions in place to serve your clients better. The Manifast™ Online Business Tools are a set of powerful and innovative cloud-based applications aimed specifically at providing solutions for small to mid-sized business. When you create a business software tool you are forced to understand the underlying business problems and solutions in great depth. A big goal is to make the tool as simple as possible to use while not restricting the power of the tool to be useful in the real world. One of the most powerful benefits from using the tool is that you get all of the experience and best practices applied to your business, without have to become a full-fledged expert in the underlying theory and details. The Manifast software tool will help your organization learn, apply, and build a great business. Strategy – Build, plan and execute a winning strategy. Working on the Business – Build a great company that runs with or without you. Develop Your Team – Ensure your people have the knowledge, skills and experience required to succeed in a complex and changing role. A Learning Organization – Increase engagement and change success by involving your entire team in the brainstorming, planning and execution. Accountability – Delegate, measure and hold your team accountable for business results. Projects and Time Tracking – The ability to work on team projects and track time across the organization. Value Pipeline – Conceive, build, market and sell great products and services. Visibility and Team Communication – Communicate everything from your overall core strategy down to the details of execution. Ensure your team is always operating from the same playbook. Collaboration – Your team will always know who is responsible for what, and what needs to get done via projects, outcomes and tasks. Most Important Work – Ensure that the most important work for your business, long and short-term, gets the right amount of focus by everyone on the team. Cloud Based – You can access it anywhere and have no infrastructure to install or manage. 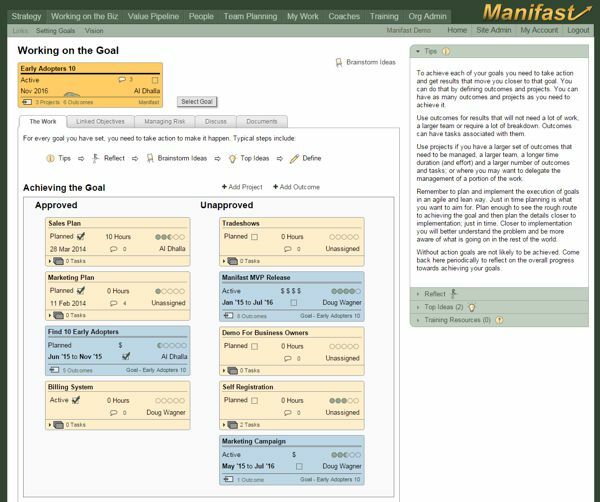 You can use the Manifast™ software tool by itself or with the rest of the Manifast™ Business System for Sustainable Growth and related services. To learn more or sign-up for out tools, give us a call.